There was no jealousy on his wedding day, because Nick Jonas felt like the luckiest man in the world. New footage from the former Disney idol’s wedding to Bollywood superstar Priyanka Chopra was unveiled Tuesday, December 4, and one particularly moving moment shows Jonas wiping away a tear as he awaits his bride. Chopra posted a clip from People’s exclusive footage released as part of their cover story. “Once upon a fairytale,” the Quantico actress captured her post. The moving, sweeping footage, documented by Caleb Jordan Lee of East West, shows Chopra slowly making her way down the aisle in an elegant, hand-beaded gown custom designed by American designer Ralph Lauren. The gorgeous piece was accentuated by a 75-foot long train held by multiple people as Chopra walked along the grounds of the Umaid Bhawan Palace, a Taj property in Jodhpur, India. Jonas, with his brother Joe Jonas to his left, watched as Chopra emerged from the property and down several steps with her mother by her side. (The bride’s father passed away from cancer in 2013.) As she neared the majestic altar, Jonas smiled as he casually wiped away a tear, clearly overcome by emotion. The couple married before 225 guests during a five-day wedding weekend planned by Abu Jani Sandeep Khosla and Motwane Entertainment & Weddings. The actress carried a bouquet comprised of tuberoses, which she revealed as her favorite flower. The entire florals were designed by Jenya Flowers, a New York City based vendor. 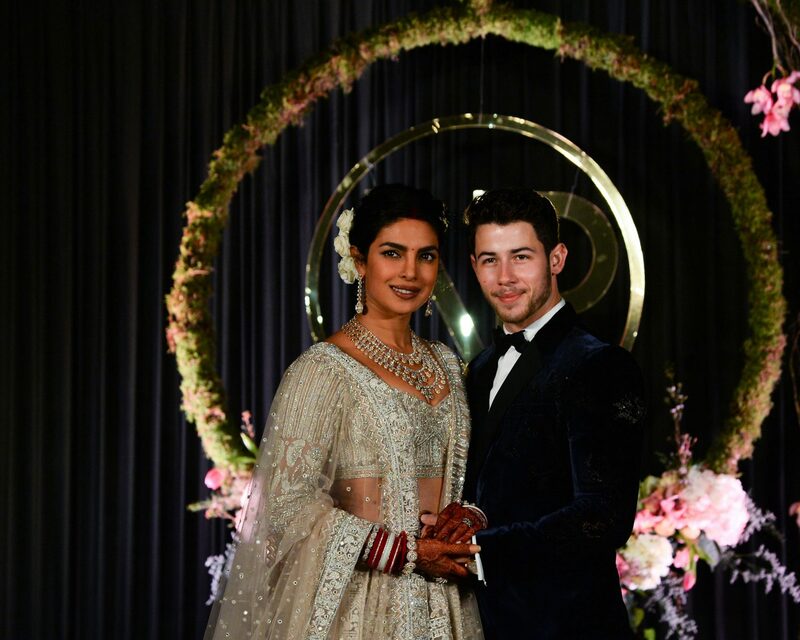 Be the first to comment on "Nick Jonas Teared Up as Priyanka Chopra Walked Down the Aisle: See the Stunning Wedding Video"